Are you looking for 2019 Christmas Lottery? Niño or any other lottery draw? This is the right place. More than 40 years of experience demonstrates our knowledge about lotteries. Florentín Barona started his commercial career related with Spanish National Lottery and, many years later, passed on this experience to his own National Lottery distribution shop and we offer you nowadays in order to provide you with the best service. He was succeeded by his wife Mª Pilar Hernández, who has been in charge of this business since 2008. Currently Jesús Barona, son of this couple, manages it following the family tradition. 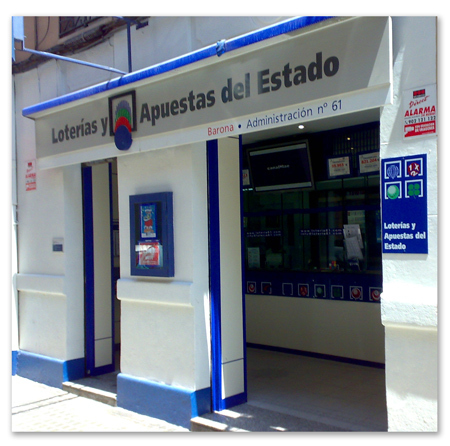 Through our webpage you can access to all required information related to Spanish Government Lotteries. You are also able to buy your lottery tickets at our online store, and ask for our consultancy and orientation services in order to achieve better results for your bets. The lucky number, winner of 50.000 € per issue (10 tickets) was …. You can find Press information HERE. If you come to Valencia you must visit our store in order to admire and watch one of the amazing paints of the great Valencian artist José Hernández Úbeda, where he combined flawlessly gambling (represented by the lottery tickets and numbers) with San Valero’s Tower and Miguelete, the most characteristic icons of Ruzafa neighbourhood and the city of Valencia respectively.